Looking for an amazing meat alternative for your BBQs? 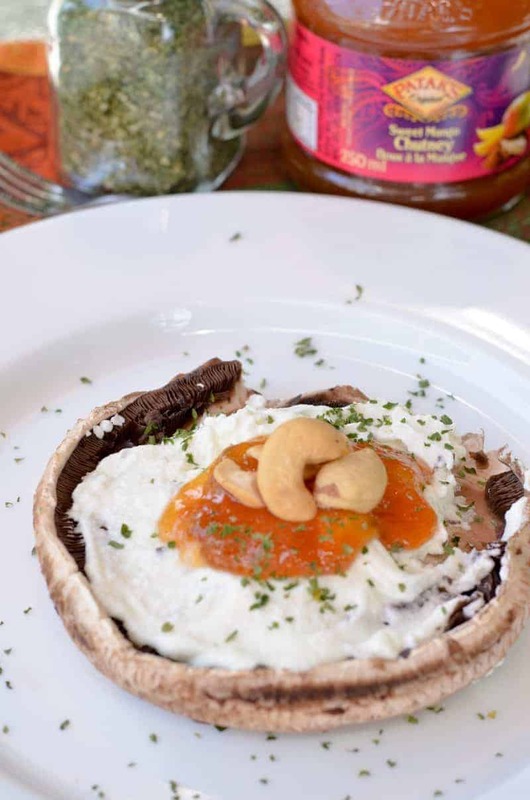 You have to try this delicious grilled portobello mushroom recipe, with goat cheese and yummy Mango Chutney! I guess by now you know that I am fond of cheese, any kind of cheese. It is my guilty pleasure and I try to add it to my meals whenever I can. I also like mixing the flavours and trying new recipes. like this Brie in the oven with Mango Chutney or this homemade Guacamole with Goat Cheese. So when Patak’s Canada challenged me to use Mango Chutney in a BBQ recipe, I thought it would be good idea to involve cheese in my recipe. Mango Chutney and cheese mix well together. The following recipe is perfect for your summer gathering or Canada Day celebration. It is very easy to prepare. It has a nice presentation and it can be served in individual portions. But make sure to serve something lighter after as portobello mushrooms can you fill you pretty quickly. Put them in a bowl and add lemon juice. Add some salt and pepper to taste. Then brush the caps with olive oil. Grill the mushrooms on each side for few minutes. Remove from the BBQ, add the Mango Chutney and nuts. Enjoy it while it is hot. The mix of nuts, cheese and mango chutney is absolutely fantastic to the palate. You can change the amount of the sweet mango chutney to your taste. Some people prefer adding more, some of them less. I usually give the options to the guests. Head over to Pataks Canada to check out more delicious ways to spice up your BBQ season! Don’t forget to check out Patak’s awesome Tumblr, Good Korma for even more ideas! Follow on Facebook and Twitter to keep up with all their exciting news! Have you ever made a grilled portobello mushroom recipe before? What do you like to put on it? Wow! These look so delicious.I love the taste of goat cheese and mango.They will be awesome!!! Looks good! I’ve never really had portobello mushrooms but would absolutely try it. This recipe might be just what I need to give them a try! Not much of a mushroom fan, but I love goat cheese and mango chutney (I usuallly have it on samosas). I will have to give this a try! That is the biggest mushroom I’ve ever seen! I love mushrooms and haven’t tried it them on the BBQ before or with goat cheese, great idea! This sounds totally interesting and delicious. We love portobello mushrooms and goat cheese. Yummy!! I am so going to make these because I have never had something like this before but it sounds and looks so good. Thanks for sharing. 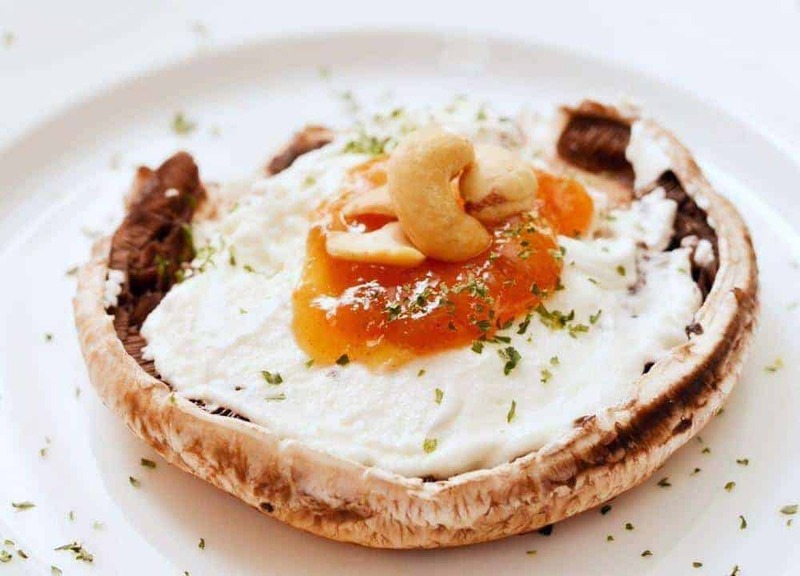 I have never tried mango chutney but the words portobello mushroom and goat cheese just made my mouth water, this sounds amazing! Thanks so much for sharing! While I hate mushrooms, this is something my parents would absolutely love! I can’t wait to send this to her so that she can try it! We’re having stuffed portabellos tonight with cheese and Old Bay seasoning. So good. I’ll have to try this too! Wow. I’m not a huge mushroom fan but this looks amazing. Very good, I wonder if my kiddos would like this? I know my husband would, but they could be difficult. I will have to give it a try! Omg this looks absolutely delicious!!! I just love mushrooms and goat cheese so to have them together!! Yum!!! This looks delish! Pinned so I could give it a try. It also looks so easy to make. Great for a quick thing to do on the grill. I love goats cheese and combined with mushrooms, this is a great recipe! One I have now put on my list! I just ate, but I could certainly go for tasting one of these right now! I always throw these into my cart and never really know how to cook them. This seems like such an easy way to make an amazing meal. Thanks so much for the idea! This is such a great dish! I make something very similar and my family loves it every time – even my super picky husband! Excellent recipe share. I’ve never had portobello mushrooms, but this looks like a wonderful way to enjoy them. I’ll bet the flavours compliment one another wonderfully! I’ve never been a big mushroom fan but this looks like something I would love to try! The flavors sound amazing and I bet it’s really delicious! Yum! That looks so good. I love portobello but we don’t make it very often at home. Might have to try that one! I’m not a huge fan of mushrooms, but I know this is something my mom would love (she’s obsessed.) I’ll have to send her this link. This is definitely an interesting combination of ingredients that I would have never thought to put together. I have only had portabello mushroom a few times. Now this makes me drool – haha looks really good! I’ve never had sweet mango chutney but we have mango trees! I wonder if I can make it myself to use with this dish. Oh WOW!! These grilled portobello mushrooms look amazing!! I am trying to eat clean and will definitely add these to my list!! Oh wow! That looks so good. I haven’t ever tried goat cheese before so this would be a new little treat for me. It looks so good. I love this idea! We love mushroom but haven’t tried using portobello mushroom. Thanks for sharing this. I have never tried mushrooms before…ever…but this looks like it might be worth a try! Thanks for the recipe. I love mushrooms and I love goat cheese with all my heart and soul, I have to try this at least once! We’ve been having a lot of grilled portabellas lately, but I hadn’t thought to put topping on it. I will have to try this! I love this recipe and must try it. I will probably chop the nuts up small. As we have teeth issues in my family. All that flavor! We always have Patak’s in the fridge….LOVE the chutney! That sounds so yummy! I’m a huge fan of portabello mushrooms, and the combination of goat cheese and mango chutney… deelish! It sounds delicious and looks amazing. I don’t know how you got it to plate so well, but it looks incredible. We have most of these ingredients in the house already, so maybe we can try it out this weekend! Thank you! I’ve never tried portobella mushroom but this looks great! Thanks for sharing the recipe with us.